Dongfeng duolika 8cbm milk truck, adopts dongfeng original chassis, B07 single row driver cab, 3800 wheelbase, chaochai 4102 engine, 535 transmission with low-high speed and over-drive speed, 2ton front bridge, 4.2ton rear bridge, 7.50-16 nylon tyre, air-cut brake with power steering and clutch booster, etc. Dongfeng duolika 8cbm milk truck with two components, The outer layer with insulation layer to avoid the fresh milk going bad. The inner tanker is polished by the special equipment, and making sure no milk hanging. The inner tanker is smooth, non sharp angle, etc. There is CIP(cleaning device) installed for the five rooms. 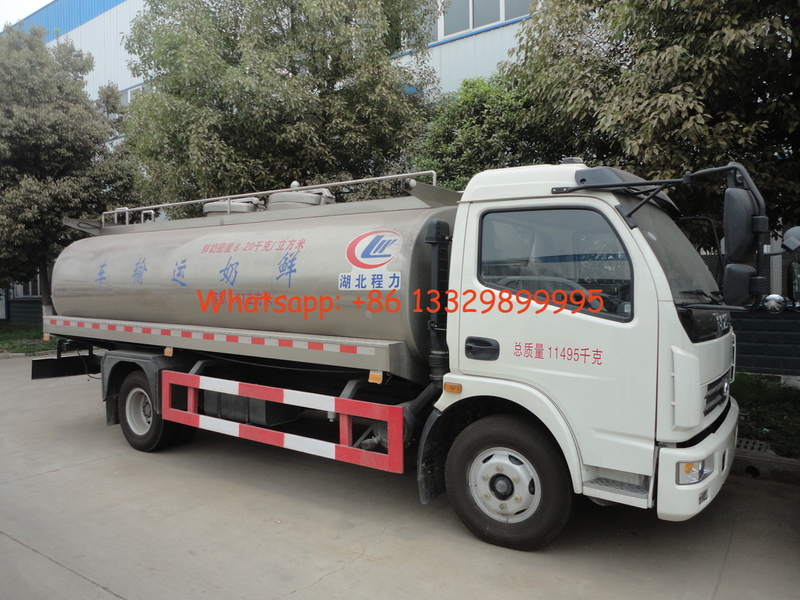 There are three layers of the milk semi-trailer, the inner tanker is manufactured by 5mm thick 304/2B food grade stainless steel; the middle is 80mm PU foam insulation layer, and 60mm PU foam of the manhole part, the temperature will be changed one degree within 24 hours; the exterior of the tanker is 1.2mm thick 304 stainless steel mirror panel. The inner tanker has cleaning device, cleaning rod(cleaning ball), cleaning pipe(with the diameter of 38mm), turntable cleaning sprayer, etc. Automatically cleaning when with water source. If you're interested in our milk truck, please kindly send email to szhj9999@163.com or call +86 13886878855. Tank capacity:7.6 CBM tank dimension(length*long axle*short axle)(mm) 4,950*2,010*1,340. (the real dimension is 4,790*1,850*1,180) the outside insulation layer height is 80mm). The drive cab depends on chassis. The protective material: Q235A carbon steel, the connection way: the two sides and rear bottom protections use welding. The rear protection section dimension(mm) 300*50*5, and the height to the ground is 510mm. 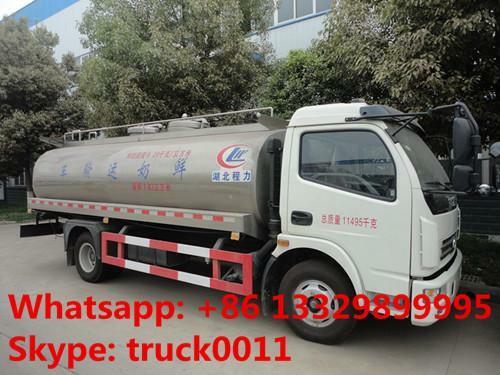 Chengli Special Automobile Co., Ltd. promote milk tanker truck at the beginning of 2014 year. 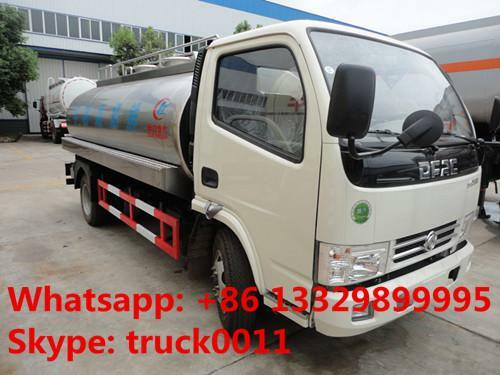 Chengli Special Automobile Co., Ltd. milk tanker truck is also called milk tanker, milk delivery truck, milk refresh transportation truck, liquid food transfer truck, mainly used to transport fresh ewe’s milk, milk, fresh fruit juices, edible oil, bulk beer, etc. fresh milk delivery truck has the advantages of perfect insulation and anti-corrosive, assuring the products the temperature range changes between 1 ℃ within 24 hours. Fresh milk truck transport milk among 3-28ton, fresh milk tanker semi-trailer can transport milk among 30-45ton. The milk tanker adopts 304 food grade stainless steel , 70mm-80mm polyurethane foam insulation layer, 2mm thickness 304 stainless steel overwrap. Perfect manufacturing techniques, delicate outlook, high price ratio. Now it’s exported to 30 countries, welcome with the people.